Üsküdar Çevresi: Quotation: Princeton University A World History of The World, "Henry Kissinger: A Prophet of the Multi-Polar World?" Quotation: Princeton University A World History of The World, "Henry Kissinger: A Prophet of the Multi-Polar World?" This week we examined two documents, one being a speech by President Nixon on “the United States no longer being in a position of complete preeminence or predominance.” Nixon highlights that the world is no longer split between the two super powers, the Soviets and the Americans. He names three other emerging powers—Japan, Western Europe, and China—that are able to challenge the U.S. on new fronts of technology, economic productivity, and military might. Nixon believes that the emergence of other powers is a positive step to ending the Cold War and progress towards global peace and stability. According to Nixon, the bipolar world of the 1950’s and 1960’s between the US and Soviet Union did not offer the best recipe for global peace. Armed with nuclear capabilities, the concept of mutually assured destruction seemed inevitable if the two powers ever clashed. For example, the Cuban Crisis almost brought the world to the brink of destruction because there was no counterweight to the conflict between the only two real superpowers. Thus, Nixon envisioned a multipolar world as a more stable, productive community. What is mutually assured destruction you ask? This cartoon illustrates the irony of the Cold War with the presence of mutually assured destruction. This shows both JFK and Kruschev "flexing" their muscles trying to illustrate the strength of each country. The irony is that JFK has his finger near the button that would detonate the bomb that Kruschev is sitting on, which, would inevitably set off the bomb that Kennedy is sitting on. This illustrates the kind of encounters these two great super-powers had during the Cold War. They quickly realized that negotiations on the basis of mutually assured destruction had no positive outcome. Therefore, as the Cold War progressed, the United States sought to create a policy of détente, or a "thawing out of relations," which is the subject of the next document we analyzed. Détente - The next document we analyzed was Henry Kissinger’s Defense of his Détente policy. This policy was a movement away from conflict and towards cooperation between the two superpowers. Détente called for such things such as SALT (Strategic Arms Limitation Treaty) to limit military intimidation and foster a productive relationship. The Secretary of State attempted to create a new world order based on the friendly relationship between the East and the West. Instead of an Eastern block and a western block, Kissinger envisioned a multipolar world based on global equality and a mutually beneficial global community. While this map shows that the bi-polar system seems to be intact and the two great powers seem to be equally matched, we must take into account the state of affairs during the time period. 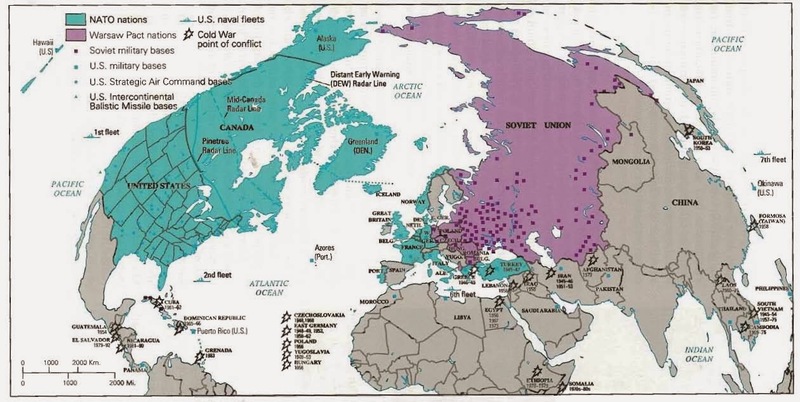 It is easy to use our hindsight bias and say that the United States did not need to worry about its status as a great world power (as a result of the many struggles the Soviet Union was having); however, we must examine what else was going on during this time period in the United States that would create this perception. Why did Kissinger believe a new world order under the multipolar system was necessary for future success of the United States? To answer this question we must analyze the historical context of the 1970’s. The United States was suffering from a crisis of confidence. The U.S. had just finished a widely unpopular war in Vietnam and the country seemed to be splitting. To make matters worse, the 1973 war in the Middle East caused an oil embargo from the members of OPEC which led to a full blown economic recession. Finally, in 1974 (the same year as Kissinger’s document) President Nixon was on the verge of impeachment for his alleged role in the Watergate Scandal. Put together, America seemed to be loosing its grasp as the preeminent world superpower. The Soviet Union, by contrast, seemed all-powerful. Because the Soviets had a monopoly on information within the country, they could maintain the façade that everything was running smoothly. By the mid 1970’s the Soviets looked as if it had overtaken the U.S. as the most dominant, powerful country in the world. Therefore, Kissinger’s vision of a new world order under the multipolar system was a hedge against the Soviet Union surpassing the United States. The odds did not seem in America’s favor if the Soviet Union headlined a bipolar world. In the face of this potential threat, Kissinger and Nixon’s policy of Détente opened the idea of a multipolar world to create new order and stability.